I know I am little bit late here—as in the show closes today. How can this be? How did winter become spring, dark become light, ice become dirt? How did I go from schlepping this show to the airport post office only to have it be so quickly on its way back to me? It happens. And so I find myself writing about this great little show in the last moments of its existence. 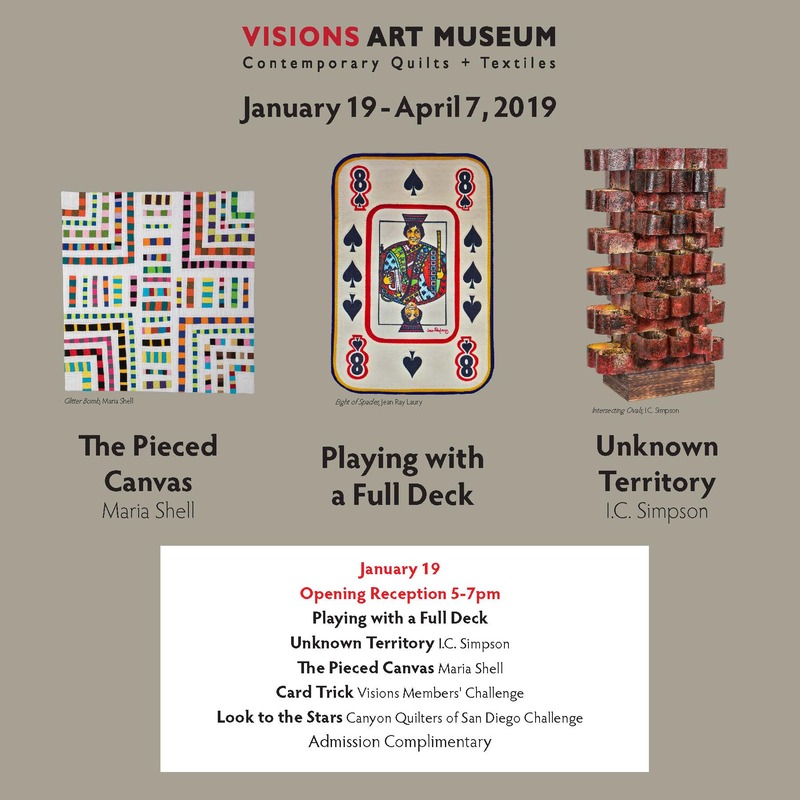 Back, more than a year ago, the curators at the Visions Art Museum contacted me about having a solo show in their Sebastian Family Gallery. The truly lovely thing about this ask was that they were so polite, as if I was doing them a favor. Of course, I would love to have a show in your beautiful museum—why thank you for asking. And then came a series of, in hindsight mostly comedic, misunderstandings centered around my inability to understand how small the gallery actually was. That along with a jammed packed teaching schedule meant I didn’t really get down to the nuts and bolts, needles and pins, sizes and shapes of what I was going to do until a bit later in the calendar year than I would have liked. In the end, I decided to create a series of new work all measuring approximately 24’’ x 24’’ in size. Way to Grace’s, Night, and Day are older pieces that would serve as the inspiration for the future works. Instead of multiplying out the Crossed Square quilt block I often work with, I would simply blow up one Crossed Square block to be 24’’ x 24’’ in size. Or, as I did in two of the new pieces, shrink down the block and repeat it out in an assortment of colors and prints. The exhibition is called the Pieced Canvas. You can see images of the quilts in progress here. Walt and I went to San Diego for the opening. We showed up for the event a day early! I just couldn’t seem to stop making weird little mistakes related to this exhibition. The next day, on the ride over to the exhibition, I was told that I would be giving a talk. WHAT? Visions likes to keep it loose and finds that many of the artists freak out if they know in advance. Here I am winging it. I have no recollecton of what came out of my mouth, but I was told afterwards that I was funny. I’ll take that. Glitter Bomb is a smaller version of Mirror Ball. We are not in Kansas Anymore made me think of the Yellow Brick Road. Hence the name, and well you know, we left Kansas in 1996. 23 years in Alaska! Liberté is about the The Statue of Liberty and all that. Sum & Parts is a smaller version of a very large quilt I have been working on forever. This might be my favorite one from this show. King Julian—Walt named this one, and I am still not sure that it is right, but I have not come up with a better one yet. Yes, my quilts do change names. Fire in the Belly is named after the biography and artwork of David Wojnarowicz. I was listening to this book for a good portion of my time working on these quilts. It is a great read about a truly historic moment in the New York City art scene. Fun House came and stuck as a name. Sometimes it just works that way. More Agnes is the starter dough of so many of my quilts. The bits that keep on giving. Checked Out is a play on words which I always like. I completed nine new quilts for The Pieced Canvas. I hope you have enjoyed this virtual show. Where are your quilts going? I’d love to hear your news too. 07 Apr	This entry was published on April 7, 2019 at 3:10 PM. 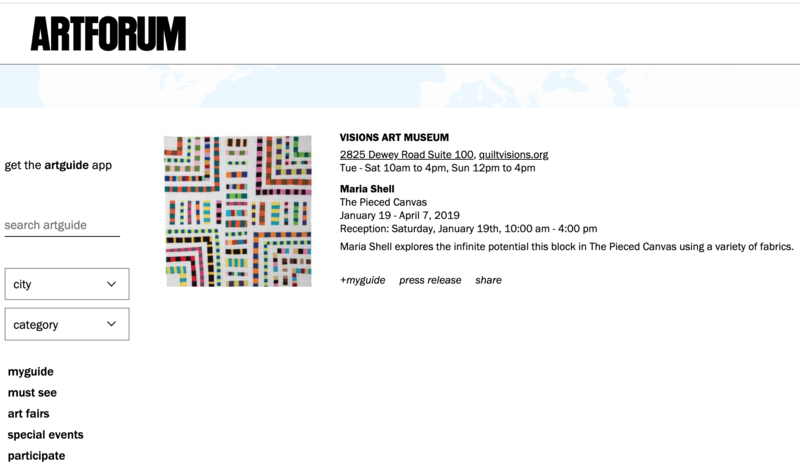 It’s filed under Exhibition News, News And Events and tagged Color Grids, New work, Solo Show, The Pieced Canvas, Visions Art Museum. Bookmark the permalink. Follow any comments here with the RSS feed for this post. Fantastic exhibit! I always think of you as an artist who paints with fabric! I love your pieced quilts! It always makes me want to go play with small pieces of solid fabrics! When we visited a friend in San Diego I was fortunate enough to see this wonderful exhibit. I initially followed your work as a former Alaskan, just missing the place I’d lived for so long. And now as a quilter who enjoys your artwork. I guess the colors just speak to me. Beautiful work! Wish I could have seen this in person. Enjoyed the virtual show very much – thanks! Thank you for sharing your beautiful show with us!!! 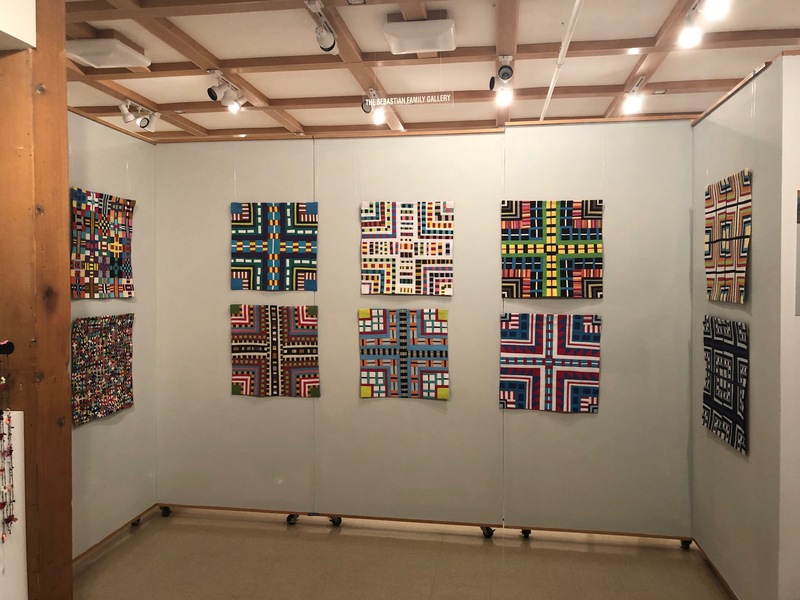 I would love to see your quilts in person as they are divine!!!! Nobody does it like you!!!!! I am such a big fan of your work. Very pretty picture of you too! I wasn’t able to make this exhibit so thanks for sharing the photos and information. Congratulations.